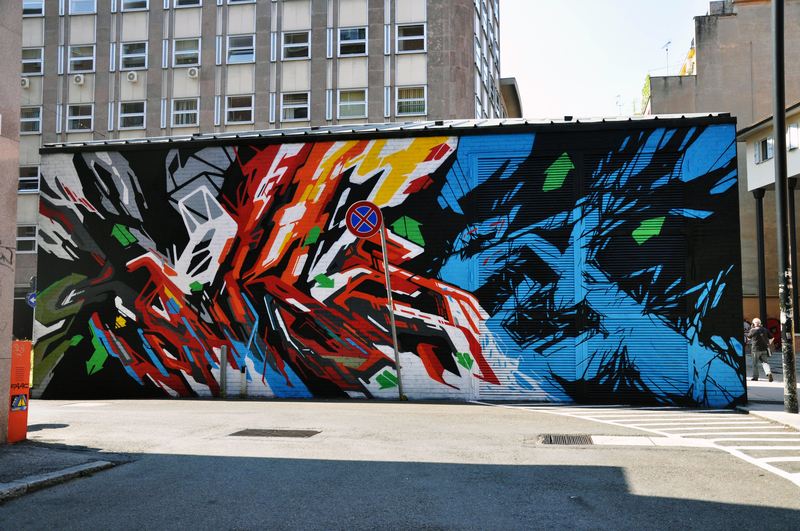 Here is a quick recap of the first murals completed for Frontier “The Line of Style” Festival and artist talks in Bologna, Italy. 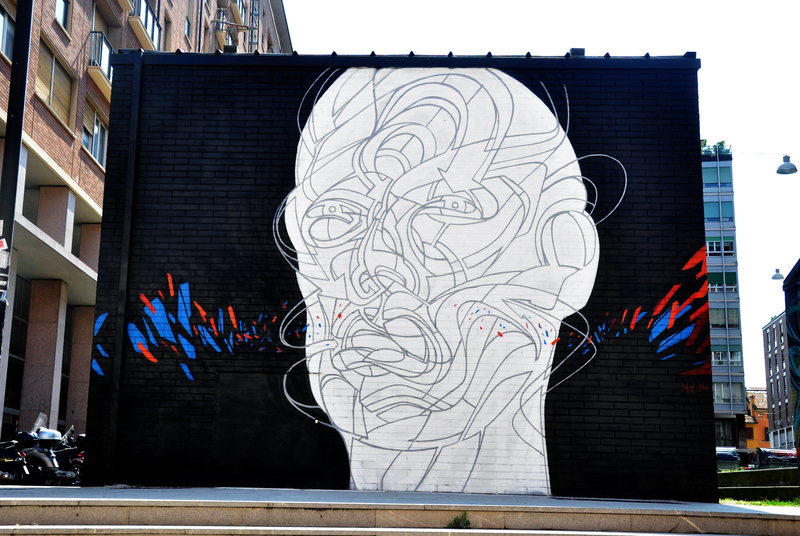 The first walls completed were painted by Italian artists Peeta, and Rae Martini as well as French artist Lokiss. 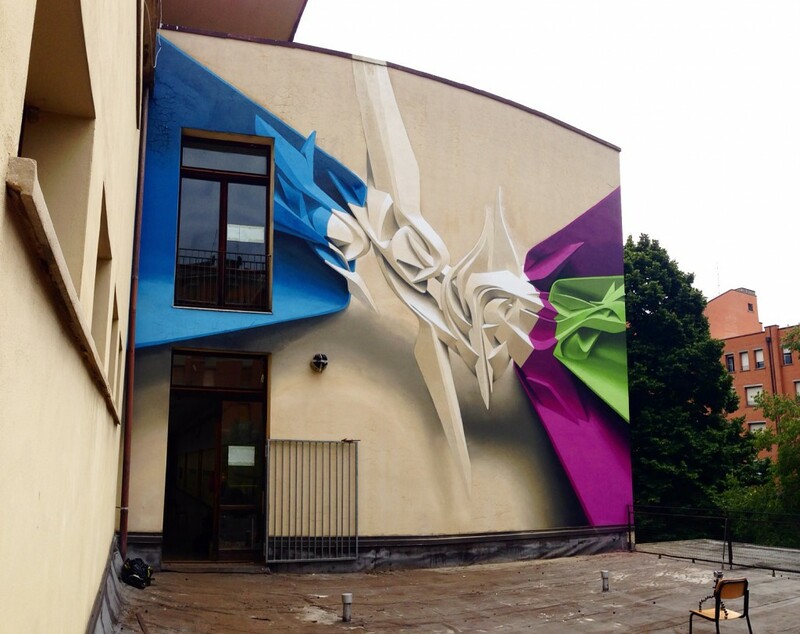 More walls will be painted in Bologna throughout the week as well as another artist talk and Mural from Poesia. Stay tuned for a full recap next week on the complete festival. We strongly suggest you read the press release below and get familiar with this impressive festival curated by Fabiola Naldi, and Claudio Musso. Frontier – The line of style is a project promoted by the City of Bologna, in collaboration with Regione Emilia-Romagna, to enhance the two disciplines of Writing and Street Art through a deep reflection about these two forms, internationally recognized as some of the most interesting expressions into the contemporary art world. The project, curated by Claudio Musso e Fabiola Naldi (art critic and art historian), is ideally and historically connected to the show “Arte di Frontiera. 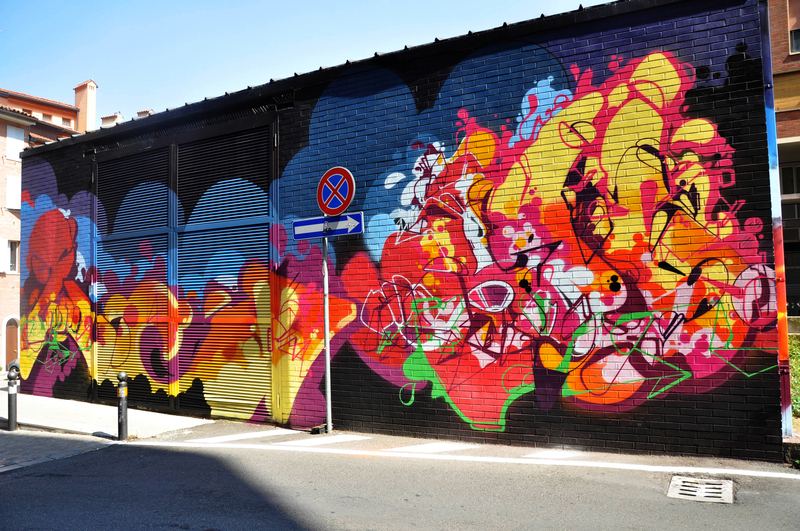 New York Graffiti”, organized in 1984 at the Modern Art Gallery of Bologna. The most important figures of New York Graffiti-Art took part at this show and later they became very famous artist as Jean-Michel Basquiat, Keith Haring and Kenny Scharf. 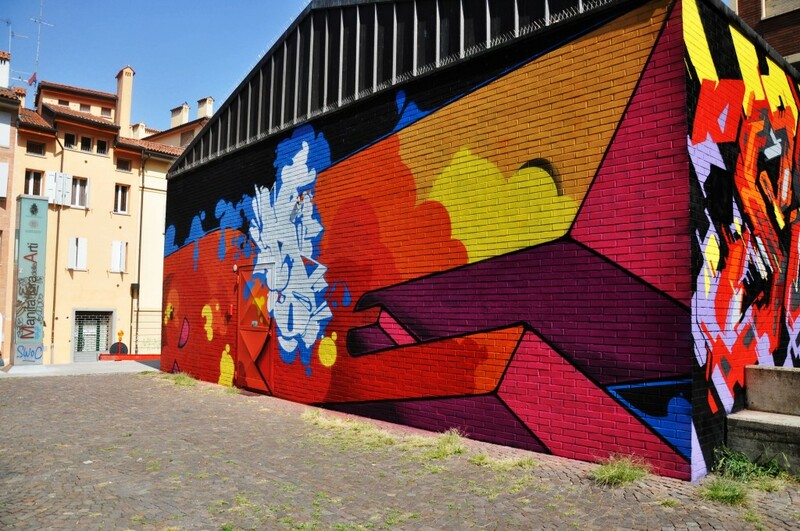 Through Frontier, the city of Bologna aims to underline and relaunch its rule as centre of esthetical production and reflection around an artistic phenomenon that had left in the city great marks both in Writing and Street Art. 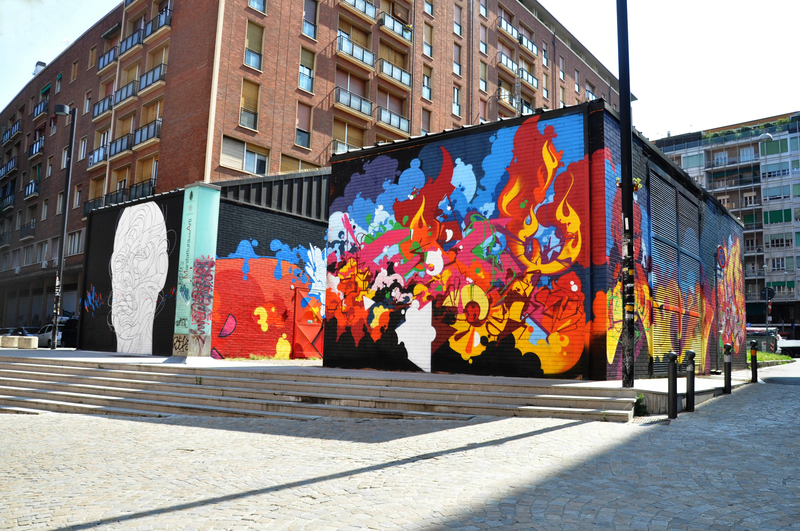 This year FRONTIER continues an important historical and artistic path to expand the number of works, following a criterion that aims to highlight the innovative stylistic components of the evolution of the Writing and Street Art. The curatorial intention operates in outdoor facades, buildings and sites located in the central and peripheral urban areas characterized by a dynamic tension. Public spaces and shared territories in which the artistic action tries to place a substantial change as an element of attraction and renewal of perception. The phase of artistic development plans, in July, August and September, the presence of italian and foreign artists who will work to create large-scale architectural and visual site-specific works. The areas identified by the curators are divided into two sections: Walls, Boxes. 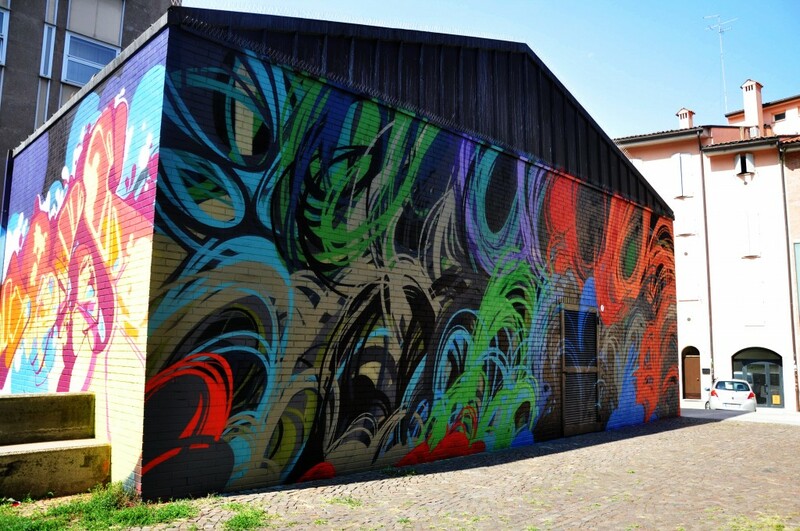 The artists invited this year belong to the last two generations that, especially in Europe, have dictated the development of codes in Writing and Street Art. After drawing a line in 2012 that, from the first american experiments came to the latest trends, in 2014 the analysis is focused on some elements of change that featured the research of artists such as the french Lokiss, the american Poesia, the polish Seikon, the italians Rae Martini and Peeta and the spanish Nuria Mora. PRESS RELEASE Bologna, June 23th 2014 in 2012 the choice of style and authors relied on those who had changed the two disciplines applying in the territory of a concrete representation and structured; in 2014 the choices were concentrated on the opposite side. This year the curators have decided to turn their attention to the artistic pursuits that tend to abstraction: starting from the essential element of the Letter for Writing, writers work for decomposition, explosion, deflagration leading to a representation of pure sign or pure color based on an informal nature. 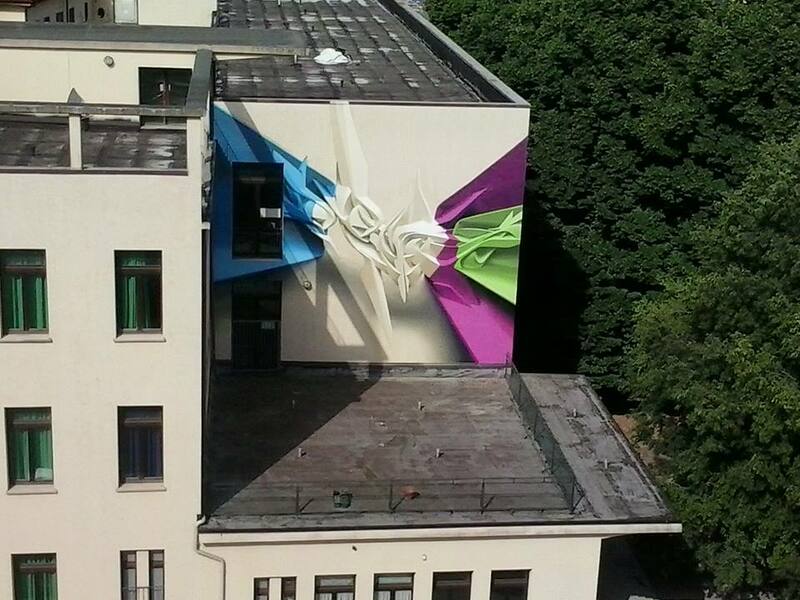 For Street Art two important solutions are here deep represented: experiences tend to abstract matrix more rigid, cold, geometric or open shapes and warm colors and examples through expanded configuration that reach the dream and the imaginative scene. The phase dedicated to deep the stilistic story of the artists is called Voices: witnesses and protagonists of the urban underground will meet the public in a series of events that will accompany the implementation of the works. For this reason the Conference Hall of the Mambo will create a real “verbal contest” where artists will talk not only about their work, but also about their own vision on the international scene. FRONTIER Walls – The section Walls, made with the cooperation of the Districts, is dedicated to the facades of large size building located in the urban area and includes three city-owned buildings under management to Acer and a wall of a school building. 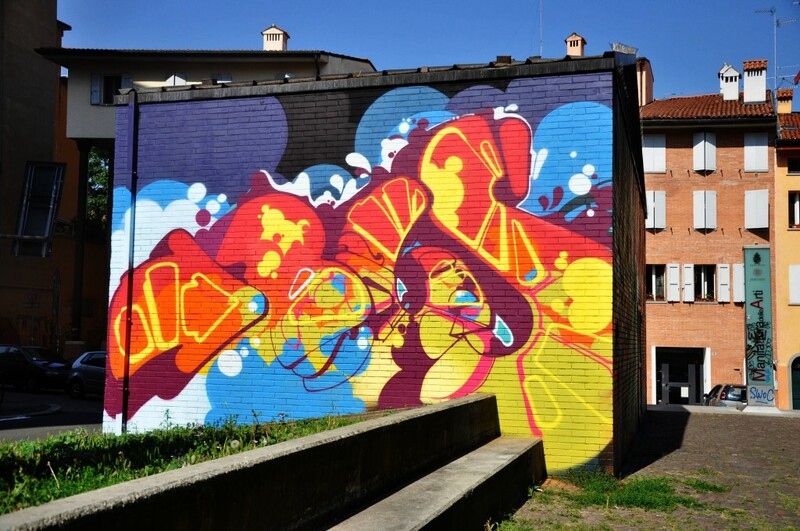 From June 30th to July 4th on the facade of Primary Schools Gualandi (in via Beroaldo n. 2 – District San Donato) will operate Peeta, one of the most important italian artist recognized in the international scene of Writing, interested in the sculptural quality of the individual letters. Through the breaking of the typographical form and standardized he creates shapes and volumes reflecting the fluidity of the urban landscape. From July 23th to 30th in via Aprile XXI 1945 n. 38 (District Saragozza) will operate Poesia, an american artist who drew the Writing (and painting) the essential elements of his research: gesture, sign, color. His works are characterized by an analysis of the painting in which improvisation plays a fundamental role and the construction of the letter leaves room for signs of nebulae and glazes of color. 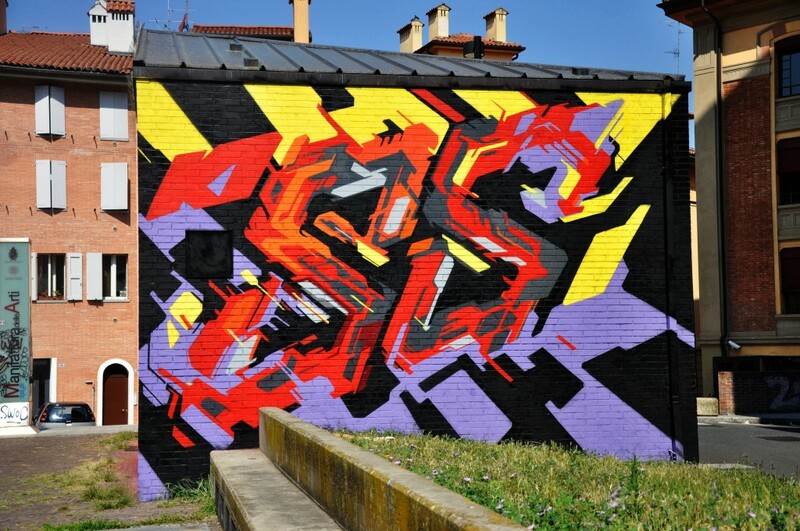 He is also the founder of the popular blog Graffuturism (following decades of progression and regression) through which recounts the evolution of graffiti culture. 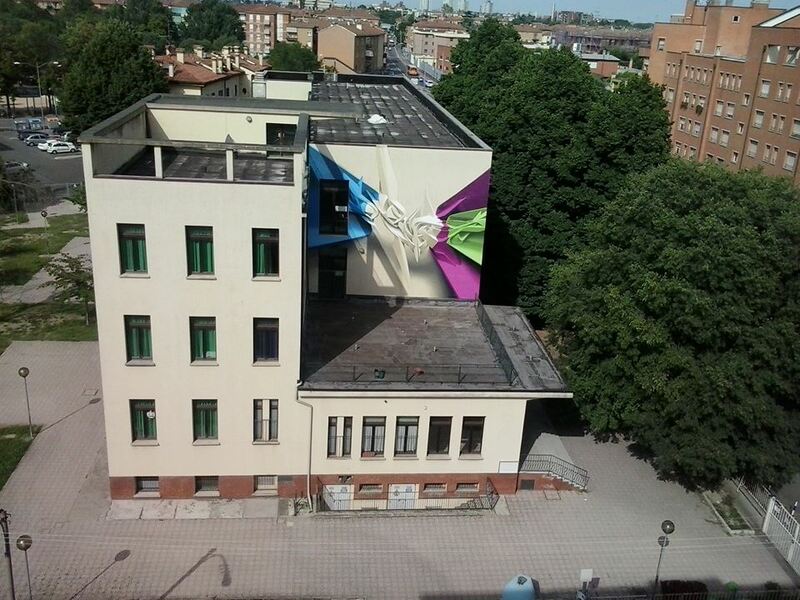 From July 27th to August 2nd Seikon will work in via Scipione dal Ferro (District San Vitale): he stands at the border between graphic design and painting who graduated at the Academy of Fine Arts in Gdansk. Active in the art world and the public space since 1999, over the years his style has evolved in the creation of unique geometric patterns that transform the areas concerned. Particularly crucial in the selection of this wall, on the opposite side of the same housing complex, is the Luigi Veronesi’s intervention, author of the undisputed Italian abstract scene since the thirties of the last century. 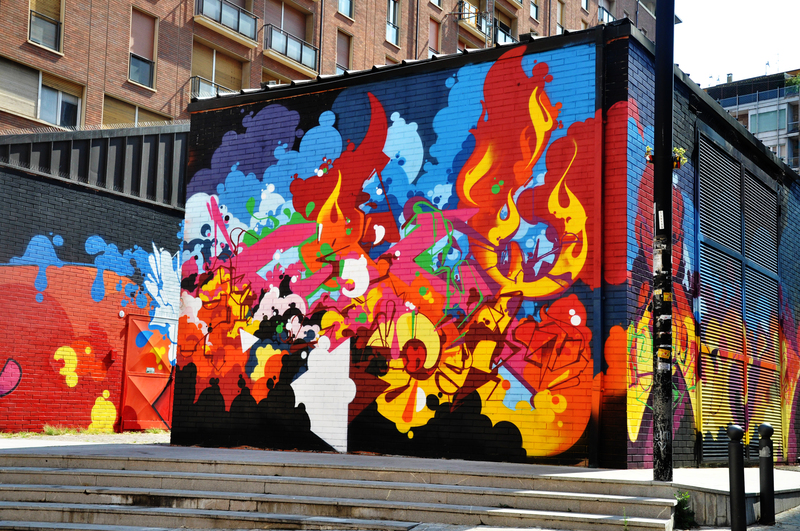 From August 1st to 7th Nuria Mora, one of the most important female voices of the international Street Art, will work in via Gianni Palmieri (District San Vitale). Her artistic intention is a dialogical interaction with the wall surface, a continuous exchange with the city. Her open shapes and her delicate colors work against saturation and overload of signs often present on the urban territory. FRONTIER Boxes In 2014 FRONTIER intends to diversify the areas where the artists will work, just like it happens naturally in the streets. It was decided, in collaboration with the Hera Group, to use the two buildings located in Largo Caduti del Lavoro which are placed at the entrance of the Manufacture of Arts, an area which is undergoing a process of re-training and re-evaluation. From july 7th to 17th will be present the French artist Lokiss, one of the prominent members of the first wave of European Writing in the second half of the ’80s. His style has always been characterized by a writing decomposed and represantions much influenced by some members of the Orphic Cubism (Delaunay, Kupka). Always from july 7th to 17th will intervene Rae Martini, one of the most important Italian writer actually present in public and private collections. His activity reached great popularity in the nineties with an original investigation of the Lettering. He combines the action of the writer, the painting research on canvas and the profession of aircraft technician: his style is a blend of various elements in which his use of color and the technical virtuosity applied to different materials. FRONTIER Voices Witnesses and protagonists of the urban underground meet the public at the Mambo – Museum of Modern Art . FRONTIER – The line of style is a project promoted and coordinated by the City of Bologna – Department of Culture and Youth in collaboration with the Housing Department and the Districts of Navile, Porto, San Donato, San Vitale, Saragozza. Previous postPreview Remi Rough "Further Adventures in Abstraction" at Soze Gallery Next postPreview Askew and Fintan Magee "Oceanic"